We rarely tell about restaurants, and we regret this very much. 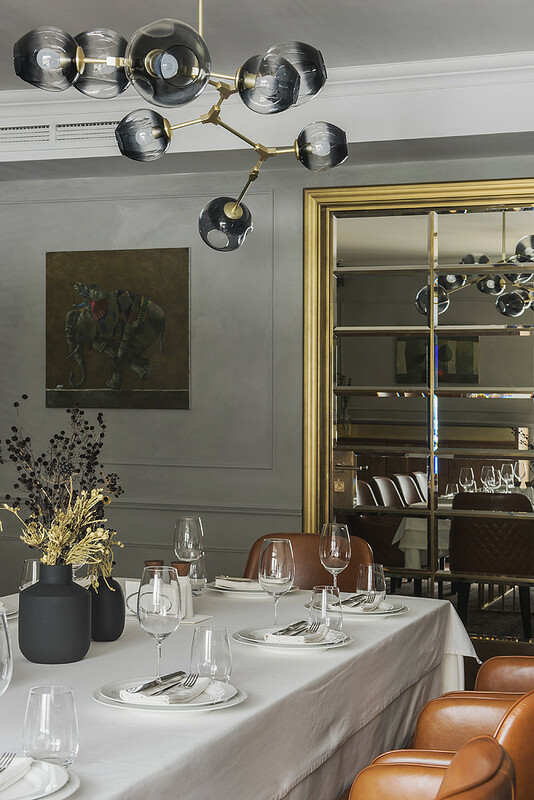 Interior becomes an integral part of gastronomic culture, helping to create a recognizable, characteristic, colorful and always incredibly tempting atmosphere of the institution. Today we will tell you about this restaurant. 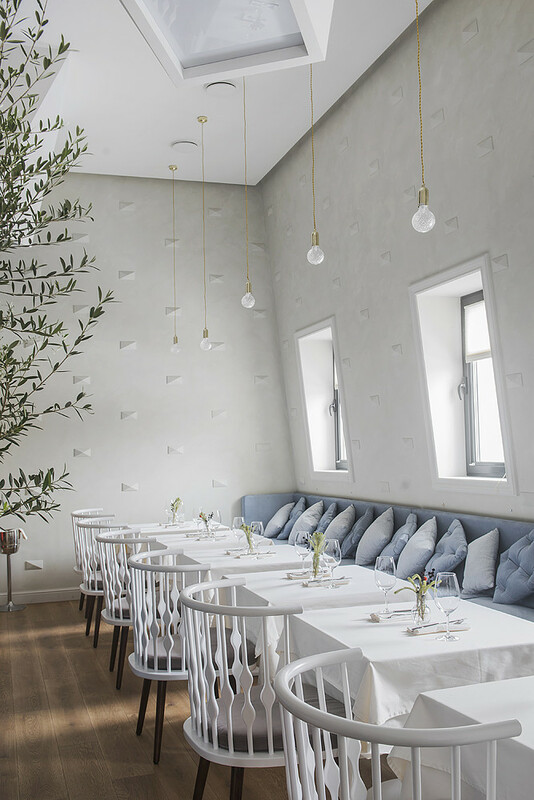 The task set for the team of designers – Valery Lizunov, Alexandra Shemetillo and Olga Nosova – was to create a topical oriental restaurant, in which there should not be an oversupply of Uzbek textures, and Asian eclecticism would naturally fit into the laconic European interior. With the customer OXUS restaurant designers met at the beginning of the design of the facility and had never worked with him before. When the designers of the project came to take measurements, the first thing they noticed was the feeling of the labyrinth. The building was a multi-level building of the 90’s with extensions of a later period. The area on the plan is 19 x 32 meters. In general, the building of the future restaurant looked like a multilevel pile of stairs, narrow corridors and balconies. There was no clear structure, but there were many corners of complex shape, which made it very easy to get lost. The restaurant building is located on Trifonovskaya Street, some distance from the business center of the city. Initially, it was a multi-level building of the 90s: a heap of stairs, narrow corridors, balconies. After the demolition of the walls and significant transformations, space finally acquired its character. The idea that was adopted for implementation is a classic Uzbek restaurant with one room and a bar on the first floor, as well as several banquet halls on the second floor. At the entrance the visitor enters a spacious bright hall filled with a large number of brass elements: a high translucent metal partition with a perforated oriental pattern and a massive door leading to the main hall. The next space, the main hall, is similar to the patio of the eastern villa, buried in verdure. To emphasize this connection, designers used white brick and grapevine. In the design of the room woven outdoor furniture is used, in the center – an atrium-like light well. Right under it is a modern interpretation of the eastern sofa (dastarkhan), with seats around. The bar counter is located in the same room, it is lined with brass tubes, covered with a countertop made of black marble. The tone of the bar picked up chairs with brass legs and black leather seats. The large hall on the second floor uses furniture of blue, blue and red shades. Between the seats there are custom-made ceramic pots with large olives. They create the mood of the winter garden. Complementing this atmosphere is natural lighting, which creates fixtures in the form of broken prisms on the ceiling. On the second floor there are three VIP-rooms. One of them – in the mezzanine room, it is separated from the general hall by decorative sliding shutters. The other two are thematically divided into “male” and “female”. “Male” room is decorated with dark marble, “female” is more calm and light. Each room has its own kitchen, where guests can observe the cooking process and even participate in it. The bathrooms are made in the Art Deco style – marble walls with a contrasting pattern on the walls, the ceramic floor sinks Azzurra are chosen in the tone of the marble veins. Furniture and light designers were selected on popular design resources and well-known, mainly foreign furniture companies, such as Fredericia, Classicon, Andreu World, Fambuena, Flos, Spiridon, Bocci, Green Furniture. Many elements, for example, a mirror in the hall, a couch in the hall on the first floor, oriental sofas, steysheny and almost all tables, were designed and made to order with the help of Russian furniture makers. The article published a photo project. Photographer: Olga Melekestseva.